“Prisons and Patriots” is Cherstin Lyon’s first book. Its publication catapults Professor Lyon, a historian at California State University, San Bernardino, into the ranks of the premier scholars of World War II Japanese American protest and dissent. Accordingly, this volume will now assume a place among seminal books like Roger Daniels’s “Concentration Camps U.S.A.: Japanese Americans and World War II” (1971), Michi Nishiura Weglyn’s “Years of Infamy” (1976), Richard Drinnon’s “Keeper of Concentration Camps” (1987), Eric Muller’s “Free to Die for Their Country” (2001), Frank Chin’s “Born in the USA” (2002), and Shirley Castlenuovo’s “Soldiers of Conscience” (2008), as well as such similarly consequential documentary films as Emiko Omori’s “Rabbit in the Moon” (1999) and Frank Abe’s “Conscience and the Constitution” (2000). “Prisons and Patriots” originated in the “Tucsonian” Oral History Project that Lyon launched at the 1999 ceremony renaming the Tucson Federal Prison Camp as the Gordon Hirabayashi Recreation Site. During World War II this facility was a minimum-security honor camp for prisoners constructing highways in Arizona’s scenic Catalina Mountains above Tucson. In 1943 it detained Hirabayashi, a University of Washington Nisei student, Quaker, and conscientious objector who the previous year had resisted U.S. government-imposed curfew and exclusion orders on West Coast Nikkei (and then later became a draft resister). In 1944 it confined 41 other Nisei, mostly inmates from the War Relocation Authority-administered concentration camps at Topaz, Utah, and Amache, Colorado, who resisted induction without having their stripped prewar U.S. citizen rights restored. Lyon draws upon her interviews with Hirabayashi and the other Nisei Tucsonians plus archival documentation to craft a compelling narrative. On one level, it conveys a multifaceted story about a largely neglected wartime confinement site. On a deeper level, though, it relates why and how its Nikkei denizens elected to demonstrate their patriotism via U.S. Constitution-sanctioned civil disobedience as against heeding combined federal government and Japanese American Citizens League propaganda and pressure to prove their “loyalty” through segregated military service. The genius of Lyon’s book lies less in the stories she recounts than in her placing them into instructive and relevant contexts. The most important of them concerns the nature of citizenship. While seemingly static in “ordinary” times, notes the author, this concept in unstable times (e.g., during World War II and today’s roiled global climate) becomes “contested, variable, fluid.” Citizenship, Lyon contends, is “not simply a set of rights or obligations to be granted [but is instead] … the relationship between citizens and the state, and [it] is redefined over the life of the individual and in response to the state’s changing needs.” Building upon this insight, Lyon persuasively advances the grounded argument that over and beyond the Tucsonians, Gordon Hirabayashi, and the several hundred draft resisters within the constellation of Japanese American prison camps, the entire wartime incarcerated population of Nikkei mounted a “strong, diverse, and at times well-organized resistance” to both voluntary service and the draft. 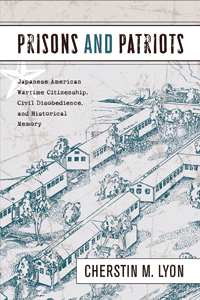 While neither the wartime acts of individual draft resisters nor the pervasive community resistance sentiment underlying them has yet attained a popular hold on the American or Japanese American collective memory, “Prisons and Patriots” promises to provide this development with considerably greater traction. Moreover, it very likely will serve the same function for those still demonized Japanese Americans who during World War II renegotiated their U.S. citizenship rights and obligations through expatriation and renunciation.